Creativity is often – erroneously – assumed to come naturally, the exclusive domain of gifted artists, musicians, graphic designers or bright minds in the advertising business. Yet creativity happens to be one of the most important prerequisites of professional success, and not just for artists but for entrepreneurs, product developers, PR experts and many others as well. This is why I highly recommend this book to any entrepreneur or manager! 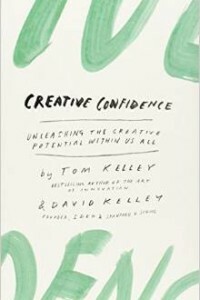 It was written by the founders of a company called Ideo that was formed in Palo Alto (located in the Silicon Valley and home to Stanford University) in 1991. This is the company that developed the first Apple mouse, for instance. One of the authors doubles as head of the Hasso Plattner Institute of Design (“d.school”), which has become one of Stanford’s innovation hubs. The book keeps returning to the importance of being willing to try out new ways rather than trying to be perfectionist. The key to success, according to the authors, is to dare take a “quick and dirty” approach, to test out a large number of ideas instead of wasting too much time on any single one of them. The first and foremost requirement is to adjust your self-image. Those who say they lack creativity are unlikely to become creative minds. The thing is: creativity as such requires no rare skills or talents. Rather, it depends on how much confidence you have in your own talent. So for starters, you should simply quit saying you are not creative! A good way to dispel any doubt about your own creativity is by taking on minor challenges and becoming more confident as you go along. Dare to tinker a little, and do not be afraid to “fail”! It is a popular myth that creative geniuses rarely ever fail in their lives. The history of science provides ample evidence that the opposite is true. If you wish to become more successful, you better brace yourself for plenty of trial & error on the way. Conversely, it is safe to say: Don’t be quick to judge, and to cast aside any solution because it seems to make no sense right away. One of the secrets of successful experimentation is to give every idea enough time to evolve before it is evaluated. Keep searching for new sources of information in order to keep your thinking crisp. Be sure to collect new impressions, and stray into unfamiliar terrain to stimulate your imagination. Relaxation and exercise have been known to enhance creativity. Studies on brain activity found that our consciousness establishes surprising connections between ideas, memories and experiences when we are at ease and not busy focusing on a given problem or a specific project. You would be amazed how many brilliant ideas are conceived in the shower or out on a walk. You should always have a little note pad on hand for your brain flashes, for they may be just as quickly lost if you do not write them down at once. Keep engaging things in your day-to-day life that just do not work and that get on your nerves. Many quotidian issues present an opportunity for a new business idea. Get going as soon as you can, this instant. Do not waste time planning ahead. It is always better to get a move on rather than waiting until you fixed all the glitches. Excessive planning, procrastinating and talking is always a sign of anxiety and of concern not to be properly prepared. And do stop telling yourself things like “Well, I could at least give it a try.” When saying this sort of thing you seem to be subtly apologizing for the fact that your heart is not in it. Put the pressure on. Give yourself interim deadlines. Many of Silicon Valley’s inventions were born on the spur of the moment with time running out – evolving much faster than they would have in a firmly established business or institution. R.Z.